I came across this review when linking to Undead Science on Amazon. It’s old, but there is no other review. I did buy that book, in 2009, from Amazon, used, but never reviewed it and now Amazon wants me to spend at least $50 in the last year to be able to review books…. But I can comment on the review, and I will. I first comment here. I picked up this book on the recommendation of a fellow scientist with good taste in work on the history of science. I’ll update this, should I get further through the book, but halfway through this book is greatly irritating. An information cascade is a social phenomenon where something comes to be commonly believed without ever having been clearly proven. It happens with scientists as well as with anyone. The beginning is largely an explanation of how science works theoretically. It is not. Sociologists of science study how science actually works, not the theory. The thesis seems to be that science traditionally is thought of as either alive or dead, depending on whether the issues investigated are uncertain or already decided. Is that a “thesis” or an observation? It becomes very clear in this review that the author thinks “cold fusion” is dead. As with many such opinions, it’s quote likely he has no idea what he is talking about. What is “cold fusion”? It was a popular name given to an anomalous heat effect, based on ideas of the source, but the scientists who discovered the effect, because they could not explain the heat with chemistry — and they were experts chemists, leaders in their field — called it an “unknown nuclear reaction.” They had not been looking for a source of energy. They were actually testing the Born-Oppenheimer approximation, and though that the approximation was probably good enough that they would find nothing. And then their experiment melted down. A third category of “undead” is proposed, in which some scientists think the topic is alive and others think it is dead, and this category has a life of its own. Later, this theme evolves to argue the undead topic of cold fusion still alive, or was long after declared dead. That is, more or less the basis for the book. The field is now known by the more neutral term of “Condensed Matter Nuclear Science,” sometimes “Low Energy Nuclear Reactions,” the heat effect is simply called the Anomalous Heat Effect by some. I still use “cold fusion” because the evidence has become overwhelming that the nuclear reaction, whatever it is, is producing helium from deuterium, which is fusion in effect if not in mechanism. The mechanism is still unknown. It is obviously not what was thought of as “fusion” when the AHE was discovered. The beginning and the last chapter may be of interest to those who seek to categorize varieties in the study of the history of science, but such pigeonholing is of much less value to me than revealing case studies of work well done and poorly done. That’s Gary Taubes’ professional theme. However, it also can be superficial. There is a fine study by Henry H. Bauer (2002). ‘Pathological Science’ is not Scientific Misconduct (nor is it pathological). One argument I’m not buying so far is the claim that what killed cold fusion is the consensus among most scientists that it was nonsense, rather than the fact that cold fusion is nonsense. If not “consensus among most scientists,” how then would it be determined that a field is outside the mainstream? And is “nonsense” a “fact”? Can you weigh it? There is a large body of experimental evidence, and then there are conclusions drawn from the evidence, and ideas about the evidence and the conclusions. Where does observed fact become “nonsense”? “Nonsense” is something we say when what is being stated makes no sense to us. It’s highly subjective. Notice that the author appears to believe that “cold fusion” is “nonsense,” but shows no sign of knowing what this thing is, what exactly is reported and claimed. No, the author seems to be believe “cold fusion is nonsense,” as a fact of nature, as a reality, not merely a personal reaction. More to the point, where and when was the decision made that “cold fusion is dead”? The U.S. Department of Energy held two reviews of the field. The first was in 1989, rushed, and concluded before replications began appearing. Another review was held in 2004. Did these reviews declare that cold fusion was dead? No. In fact, both recommended further research. One does not recommend further research for a dead field. In 2004, that recommendation was unanimous for an 18-member panel of experts. This is to me a case study in which many open-minded people looked at a claim and shredded it. According to Dr. Vidale. Yes, there was very strong criticism, even “vituperation,” in the words of one skeptic. However, the field is very much alive, and publication in mainstream journals has continued (increasing after a nadir in about 2005). Research is being funded. Governmental interest never disappeared, but it is a very difficult field. There is little difference here between the truth and the scientists consensus about the truth. What consensus, I must ask? The closest we have to a formal consensus would be the 2004 review, and what it concluded is far from the position Mr. Vidale is asserting. He imagines his view is “mainstream,” but that is simply the effect of an information cascade. Yes, many scientists think as he thinks, still. In other words, scientists can be ignorant of what is happening outside their own fields. But it is not a “consensus,” and never was. It was merely a widespread and very strong opinion, but that opinion was rejecting an idea about the Heat Effect, not the effect itself. To the extent, though, that they were rejecting experimental evidence, they were engaged in cargo cult science, or scientism, a belief system. Not the scientific method. The sociological understructure in the book seems to impede rather than aid understanding. It seems that way to Dr. Vidale because he’s clueless about the reality of cold fusion research. Specifically, there seems an underlying assumption that claims of excess heat without by-products of fusion reactions are a plausible interpretation, whose investigations deserved funding, but were denied by the closed club of established scientists. There was a claim of anomalous heat, yes. It was an error for Pons and Fleischmann to claim that it was a nuclear reaction, and to mention “fusion,” based on the evidence they had, which was only circumstantial. The reaction is definitely not what comes to mind when that word is used. But . . . a fusion product, helium, was eventually identified (Miles, 1991), correlated with heat, and that has been confirmed by over a dozen research groups, and confirmation and measurement of the ratio with increased precision is under way at Texas Tech, very well funded, as that deserves. Extant measurements of the heat/helium ratio are within experimental error of the deuterium fusion to helium theoretical value. That Dr. Vidale believes that no nuclear product was identified simply shows that he’s reacting to what amounts to gossip or rumor or information cascade. (Other products have been found, there is strong evidence for tritium, but the levels are very low and it is the helium that accounts for the heat). The author repeatedly cites international experts calling such scenarios impossible or highly implausible to suggest that the experts are libeling cold fusion claims with the label pathological science. I side with the experts rather than the author. It is obvious that there were experts who did that; this is undeniable. Simon does not suggest “libel.” And Vidale merely joins in the labelling, without being specific such that one could test his claims. He’s outside of science. He’s taking sides, which sociologists generally don’t do, nor, in fact, do careful scientists do it within their field. To claim that a scientist is practicing “pathological science” is a deep insult. That is not a scientific category. Langmuir coined the term, and gave characteristics, which only superficially match cold fusion, which long ago moved outside of that box. Also, the claim is made that this case demonstrates that sociologists are better equipped to mediate disputes involving claims of pathological science than scientists, which is ludicrous. It would be, if the book claimed that, but it doesn’t. More to the point, who mediates such disputes? What happens in the real world? Clearly, in the cold fusion case, another decade after the publication of this book has not contradicted any of the condemnations from scientists of cold fusion. Essentially, if one wishes to critically assess the stages through which cold fusion ideas were discarded, it is helpful to understand the nuclear processes involved. Actually, no. “Cold fusion” appears to be a nuclear physics topic, because of “fusion.” However, it is actually a set of results in chemistry. What an expert in normal nuclear processes knows will not help with cold fusion. It is, at this point, an “unknown nuclear reaction” (which was claimed in the original paper). (Or it is a set of such reactions.) Yes, if someone wants to propose a theory of mechanism, a knowledge of nuclear physics is necessary, and there are physicists, with such understanding, experts, doing just that. So far, no theory has been successful to the point of being widely accepted. One should not argue, as the author indirectly does, for large federal investments in blue sky reinvention of physics unless one has an imposing reputation of knowing the limitations of existing physics. Simon does not argue for that. I don’t argue for that. I suggest exactly what both U.S. DoE reviews suggested: modest funding for basic research under existing programs. That is a genuine scientific consensus! However, it is not necessary a “consensus of scientists,” that is, some majority showing in a poll, as distinct from genuine scientific process as functions with peer review and the like. It appears that Dr. Vidale has an active imagination, and thinks that Simon is a “believer” and thinks that “believers” want massive federal funding, so he reads that into the book. No, the book is about a sociological phenomenon, it was Simon’s doctoral thesis originally, and sociologists of science will continue to study the cold fusion affair, for a very long time. Huizenga called it the “scientific fiasco of the twentieth century.” He was right. It was a perfect storm, in many ways, and there is much that can be learned from it. Cold fusion is not a “reinvention of physics.” It tells us very little about nuclear physics. “Cold fusion,” as a name for an anomalous heat effect, does not contradict existing physics. It is possible that when the mechanism is elucidated, it will show some contradiction, but what is most likely is that all that has been contradicted was assumption about what’s possible in condensed matter, not actual physics. There are theories being worked on that use standard quantum field theory, merely in certain unanticipated circumstances. Quick example: what will happen if two deuterium molecules are trapped in relationship at low relative momentum, such that the nuclei form the vertices of a tetrahedron? The analysis has been done by Akito Takahashi: they will collapse into a Bose -Einstein condensate within a femtosecond or so, and that will fuse by tunneling within another femotosecond or so, creating 8Be, which can fission into two 4He nuclei, without gamma radiation (as would be expected if two deuterons could somehow fuse to helium without immediately fissioning into the normal d-d fusion products). That theory is incomplete, I won’t go into details, but it merely shows how there may be surprises lurking in places we never looked before. I will amend my review if my attention span is long enough, but the collection of objectionable claims has risen too high to warrant spending another few hours finishing this book. Gary Taubes’ book on the same subject, Bad Science, was much more factual and enlightening. Taubes’ Bad Science is an excellent book on the history of cold fusion, the very early days only. The story of the book is well known, he was in a hurry to finish it so he could be paid. As is common with his work, he spent far more time than made sense economically for him. He believed he understood the physics, and sometimes wrote from that perspective, but, in fact, nobody understands what Pons and Fleischmann found. They certainly didn’t. Gradually, fact is being established, and how to create reliable experiments is being developed. It’s still difficult, but measuring the heat/helium ratio is a reliable and replicable experiment. It’s still not easy, but what is cool about it is that, per existing results, if one doesn’t see heat, one doesn’t see helium, period, and if one does see heat (which with a good protocol might be half the time), one sees proportionate helium. 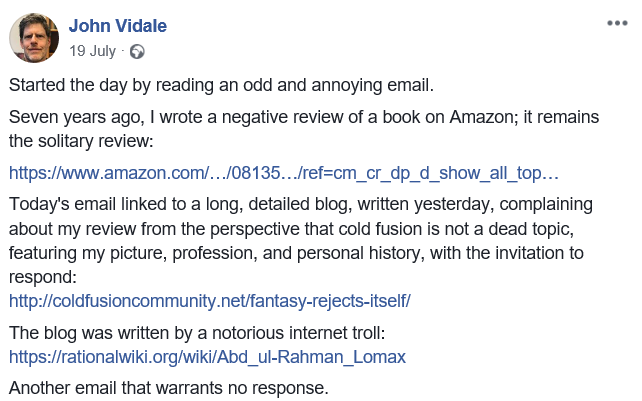 So Dr. Vidale gave the book a poor review, two stars out of five, based on his rejection of what he imagined the book was saying. There were some comments, that can be seen by following the Unreal arguments link. The video was presented by Frank Gordon, of SPAWAR. It is about nuclear effects, including heat. More telling than the personal opinion of either of us is the fact that 3 MORE years have passed since the video you linked, and no public demonstration of energy from cold fusion has YET been presented. How does Dr. Vidale know that? The video covers many demonstrations of LENR. What Dr. Vidale may be talking about is practical levels of energy, and he assumes that if such a demonstration existed, he’d have heard about it. There have been many demonstrations. Dr. Vidale’s comments were from August 2011. Earlier that year, there was a major claim of commercial levels of power, kilowatts, with public “demonstrations.” Unfortunately, it was fraud, but my point here is that this was widely known, widely considered, and Dr. Vidale doesn’t seem to know about it at all. Dr. Vidale is all personal opinion and no facts. He simply ignored the video, which is quite good, being a presentation by the SPAWAR group (U.S. Navy Research Laboratory, San Diego) to a conference organized by Dr. Robert Duncan, who was Vice Chancellor for Research at the University of Missouri, and then countered the comment with simple ignorance (that there has been no public demonstration). The commenters note is an excellent example of the sociological phenomenon related to the field of Cold Fusion, that shall be studied along with the physical phenomenon, once a change of perception of the field occurs. We shall eventually, and possibly soon, see a resolution of the clash of claims of pathological science vs. pathological disbelief. If history is any indicator related to denial in the face of incontrovertible evidence (in this case the observation of excess heat, regardless of the process of origin since we know it is beyond chemical energies) we shall be hearing a lot more about this topic. Agreed, Dr. Vidale has demonstrated what an information cascade looks like. He’s totally confident that he is standing for the mainstream opinion. Yet “mainstream opinion” is not a judgment of experts, except, of course, in part. Dr. Vidale is not an expert in this field, and he is not actually aware of expert reviews of “cold fusion.” Perhaps he might consider reading this peer-reviewed review of the field, published the year before he wrote, in Naturwissenschaften, which was, at the time, a venerable multidisciplinary journal, and it had tough peer review. Edmund Storms, Status of cold fusion (2010). (preprint). There are many, many reviews of cold fusion in mainstream journals, published in the last 15 years. The extreme skepticism, which Vidale thinks is mainstream, has disappeared in the journals. What is undead here is extreme skepticism on this topic, which hasn’t noticed it died. So, is cold fusion Undead, or is it simply Alive and never died? After writing this, I found that Dr. John Vidale was a double major as an undergraduate, in physics and geology, has a PhD from Cal Tech (1986), and his major focus appears to be seismology. He might be amused by this story from the late Nate Hoffman, who wrote a book for the American Nuclear Society, supported by the Electric Power Research Institute, A Dialogue on Chemically Induced Nuclear Effects: A Guide for the Perplexed About Cold Fusion (1995). Among other things, it accurately reviews Taubes and Huizenga. The book is written as a dialogue between a Young Scientist (YS), who represents common thinking, particularly among physicists, and Old Metallurgist (OM), which would be Hoffman himself, who is commonly considered a skeptic by promoters of cold fusion. Actually, to me, he looks normally skeptical, skepticism being essential to science. YS: I guess the real question has to be this: Is the heat real? OM: The simple facts are as follows. Scientists experienced in the area of calorimetric measurements are performing these experiments. Long periods occur with no heat production, then, occasionally, periods suddenly occur with apparent heat production. These scientists become irate when so-called experts call them charlatans. The occasions when apparent heat occurs seem to be highly sensitive to the surface conditions of the palladium and are not reproducible at will. YS: Any phenomenon that is not reproducible at will is most likely not real. OM: People in the San Fernando Valley, Japanese, Columbians, et al, will be glad to hear that earthquakes are not real. YS: Ouch. I deserved that. My comment was stupid. OM: A large number of of people who should know better have parroted that inane statement. There are, however, many artifacts that can indicate a false period of heat production. The question of whether heat is being produced is still open, though any such heat is not from deuterium atoms fusing with deuterium atoms to produce equal amounts of 3He + neutron and triton + proton. If the heat is real, it must be from a different nuclear reaction or some totally unknown non-nuclear source of reactions with energies far above the electron-volt levels of chemical reactions. As with Taubes, Hoffman may have been under some pressure to complete the book. Miles, in 1991, was the first to report, in a conference paper, that helium was being produced, correlated with helium, and this was noticed by Huizenga in the second edition of his book (1993). Hoffman covers some of Miles’ work, and some helium measurements, but does not report the crucial correlation, though this was published in Journal of Electroanalytical Chemistry in 1993. I cover heat/helium, as a quantitatively reproducible and widely-confirmed experiment, in my 2015 paper, published in a special section on Low Energy Nuclear Reactions in Current Science..
Of special note in that section would be McKubre, Cold fusion: comments on the state of scientific proof. McKubre is an electrochemist who, when he saw the Pons and Fleischmann announcement, already was familiar with the palladium-deuterium system, working at SRI International, and immediately recognized that the effect reported must be in relatively unexplored territory, with very high loading ratio. This was not widely understood, and replication efforts that failed to reach a loading threshold, somewhere around 90% atom (D/Pd), reported no results (neither anomalous heat, nor any other nuclear effects). At that time, it was commonly considered that 70% loading was a maximum. SRI and McKubre were retained by the Electric Power Research Institute, for obvious reasons, to investigate cold fusion, and until retiring recently, he spent his entire career after that, mostly on LENR research. What is scientific consensus? This is a question that sociologists and philosophers of science study. As well, most physicists knew little to nothing about electrochemistry, and there are many stories of Stupid Mistakes, such as reversing the cathode and anode (because of a differing convention) and failing to maintain very high cleanliness of experiments. 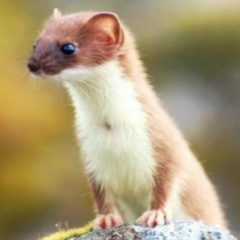 One electrochemist, visiting such a lab, asked, “And then did you pee in the cell?” The most basic mistake was failing to run the experiment long enough to develop the conditions that create the effect. McKubre covers that in the paper cited. (An electrolytic cathode will collect cations from the electrolyte, and cathodes may become loaded with fuzzy junk. I fully sympathize with physicists with a distaste for the horrible mess of an electrolytic cathode. For very good reasons, they prefer the simple environment of a plasma, which they can analyze using two-body quantum mechanics. Dr. Vidale is welcome to comment here and to correct errors, as may anyone. As before, no response is required. The troll who posted that image is also the troll who, with his brother, created and maintained the RationalWiki article, and Vidale’s comment is being used as a proof that I’m a troll. Circular. Of course, Vidale did, in fact, respond, just not in situ and not where it would be likely to be seen by me. Some people have a weird idea of what “no response” means. I could not find the post, my guess is that it was taken down. Vidale followed and believed the claims of twin brothers who are the most disruptive trolls I have ever seen, though, to be sure, the internet is vast and I haven’t seen everything! Abd – it seems to me that, from a sociological viewpoint, CF suffered much the same as any paradigm-changing discovery. Until it’s been tamed from difficult science into a technology that is seen to be undeniably real it will likely continue to suffer. That requires scientists who go against the perceived consensus and keep on working anyway despite the reputational damage (and loss of grants) until they’ve succeeded in proving the point. “We don’t have the math to calculate the solid state, it is far too complex.” It’s a shame that more people don’t realise that. In order to make it computable, we make approximations, and so the results are no longer exact. Models are rarely exact, but are useful providing you don’t believe all the predictions. Yes. The problem is not simplified models, it is forgetting that they are simplified, and that the map is not the territory. What struck me here, though, was the lack of understanding of what he was reading. He was reactive to it, projecting an argument that is not made by the book. This guy is actually a professor of seismology, with a substantial reputation, but he didn’t understand what was in front of him. Scary.